Wayne Ngata is a strong supporter of the revitalisation of te reo Māori and education models that are underpinned by Māori processes. 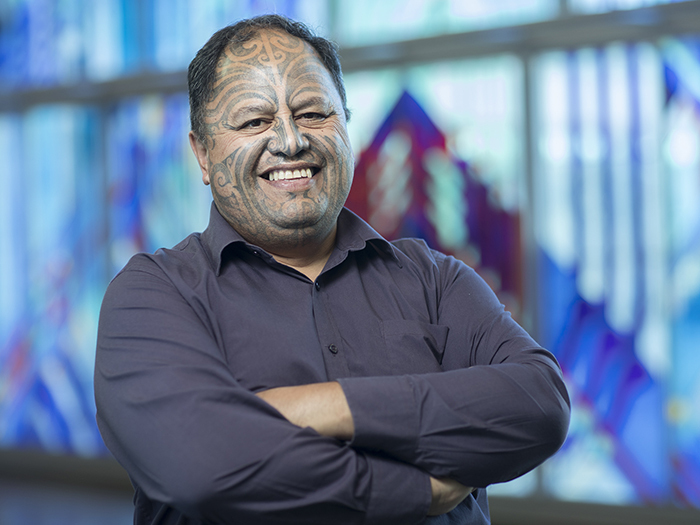 He has had a number of academic, management or governance roles at St Stephens School, EIT Tairāwhiti, Ministry of Education, Te Whare Wānanga o Awanuiarangi, Te Taura Whiri i te Reo Māori, The MacDiarmid Institute, and Tolaga Bay Area School. Wayne has helped develop health programmes that use a Māori approach including the Atua Matua Māori Health Framework1 and The Horouta Collective for Te Hauora o Te Aitanga o Hauiti. Wayne has been the lead instructor for the national kapa haka competition group Te Aitanga a Hauiti2 where he used authentic Māori physical activity training approaches to prepare the group. Dr Ngata participated in the Te Waka Tapu voyage from Aotearoa to Rapanui (Easter Island) and has a keen interest in traditional navigation and waka hourua kaupapa. In 2015 he traveled to the USA delivering Māori health leadership seminars at Harvard University, Johns Hopkins University, University of Washington, University of Minnesota, Brookings Research Institute and the Global Obesity Prevention Centre. This led to a role in a pilot research study that looked at Māori approaches to youth obesity in New Zealand. Dr Ngata has also traveled to museums and research institutes in Europe, UK and USA as part of the Te Aitanga a Hauiti endeavours to reconnect with Hauiti art and taonga as a means of reinvigorating tribal communities. He is on the board for the Tolaga Bay Surf Club which has taken steps to utilise a Hauiti approach to ocean education by removing Surf Lifesaving policies that did not allow the unique Hauiti processes for engaging with the ocean. Tolaga Bay now has the highest number of surf lifesavers per head of population anywhere in New Zealand. A specialist in Māori literature, specifically Mōteatea, Dr Wayne Ngata is the consumate all rounder, with the ability to seamlessly move between applied active roles in a physical activity domain, cultural expertise of the highest level and academic achievement3, all of which make him a natural choice for leadership modeling.